Description: Take storage and organisation to a whole new level for any Jetsetter. 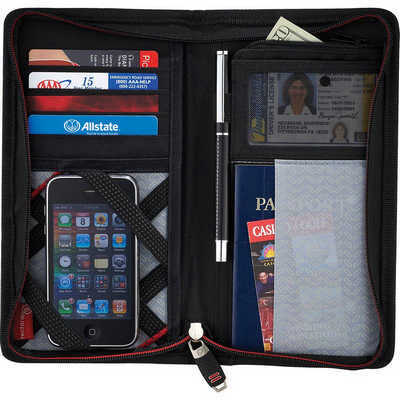 Features: Features a quick storage passport slot, four slotted pockets for credit cards, mesh ID holder, zippered coin pocket, pen holder, slotted pocket for boarding pass, and a Tech Trap area for a Smartphone, USB Memory, or other item. Packaging: In a plain black tuck box sitting in a polybag. Packaging Size: 244mm(h) x 130mm(w) x 35mm(d) Colour: Black Material: 420d Poly Product Size: 127mm(w) x 235mm(h) x 32mm(d) Freight details : 36 per carton, 9.6kgs, 44.5 x 42 x 27cms; Decoration Type(s): Colour Print / Deboss / Debossed Foil / Foil Stamp / Full Colour Print Decoration Area: Screen: 70mm(w) x 110mm(h). Price includes : 1 Colour 1 Position Print. Setup is included.